The staff at Apex Medical Spa is ready to help you safely achieve the results you desire. 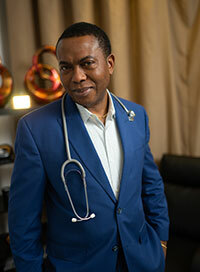 Dolue David Ezeanolue (Dr. Ez) is a multi-specialized physician. He is a qualified, trained, and experienced in cosmetic procedures. Being specialized in pain management gives him and his patients a more trustworthy and comfortable way of doing procedures. Dr. Ezeanolue is multiple board certified, experienced physician, and has received multiple “American Top Physician Awards” in Internal Medicine & Pain Management. He has over 25 years of experience and is looking forward to seeing you! Dr. Dolue Ezeanolue and staff are committed to providing the highest quality of personalized care. enjoy his/her shape for a life worth living.